New York City witnessed unparalleled growth in the first half of the nineteenth century, its population rising from thirty thousand people to nearly a million in a matter of decades. 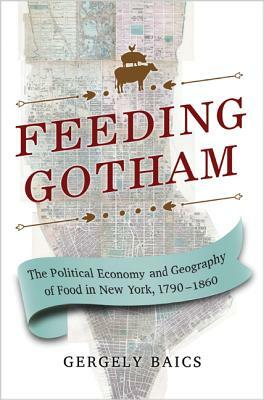 Feeding Gotham looks at how America's first metropolis grappled with the challenge of provisioning its inhabitants. It tells the story of how access to food, once a public good, became a private matter left to free and unregulated markets--and of the profound consequences this had for American living standards and urban development. Taking readers from the early republic to the Civil War, Gergely Baics explores the changing dynamics of urban governance, market forces, and the built environment that defined New Yorkers' experiences of supplying their households. He paints a vibrant portrait of the public debates that propelled New York from a tightly regulated public market to a free-market system of provisioning, and shows how deregulation had its social costs and benefits. Baics uses cutting-edge GIS mapping techniques to reconstruct New York's changing food landscapes over half a century, following residents into neighborhood public markets, meat shops, and groceries across the city's expanding territory. He lays bare how unequal access to adequate and healthy food supplies led to an increasingly differentiated urban environment.